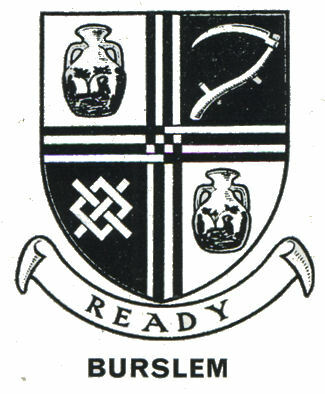 Burslem was created a borough in 1871 and in 1878 was granted a Charter of Incorporation and the right to display arms. All the six towns had and displayed arms but only Burslem (as the 'Mother' town) received a grant. Coats of arms are only granted by Letters Patent from the senior heralds, the Kings of Arms. The arms granted on the 8th October 1878 were based on those of the Burslem Board of Health. The crest is a garb (sheaf of grain) and a fleur-de-lys, between two branches of laurel. The shield was divided into four gold and red quarters with two vertical and two horizontal stripes interlaced and counterchanged. In the first and fourth quarters a Portland Vase; in the second, a scythe; and in the third a silver fret. The Portland vase represents local industry and the towns association with Josiah Wedgwood. 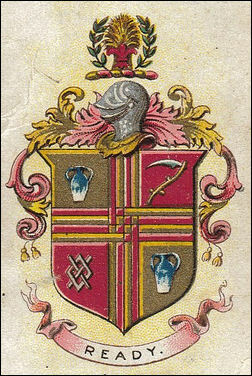 The scythe is from the arms of the Sneyd family. The Scythe also appears in the Tunstall arms. The silver fretty cross "a fret couped argent" in the third quarter is from the Audley arms. The scythe from the Burslem and Tunstall arms were used in the city arms. Burslem also contributed the Portland vase.